Periodic condensation on windows is normal, particularly in cold weather. 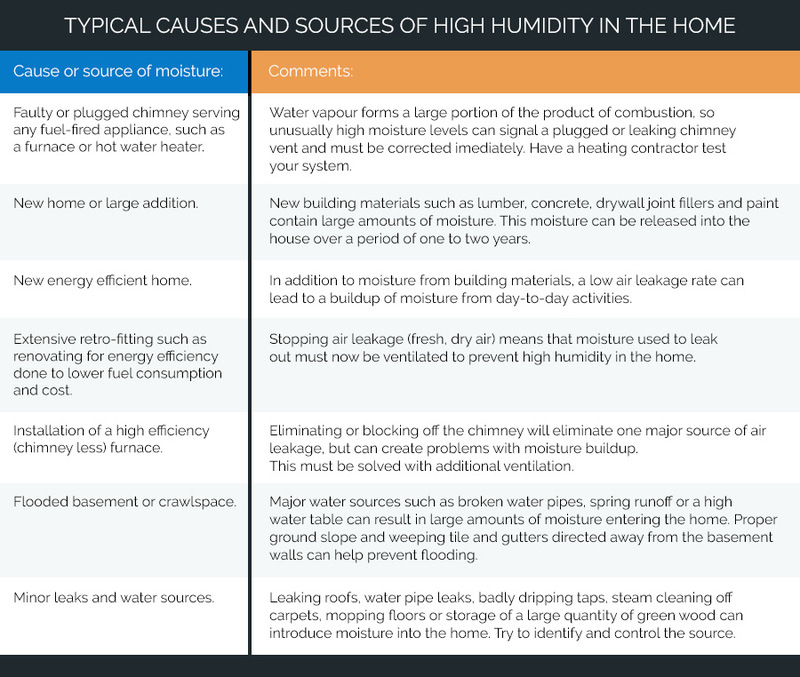 However, hidden condensation can become a significant problem if not corrected. 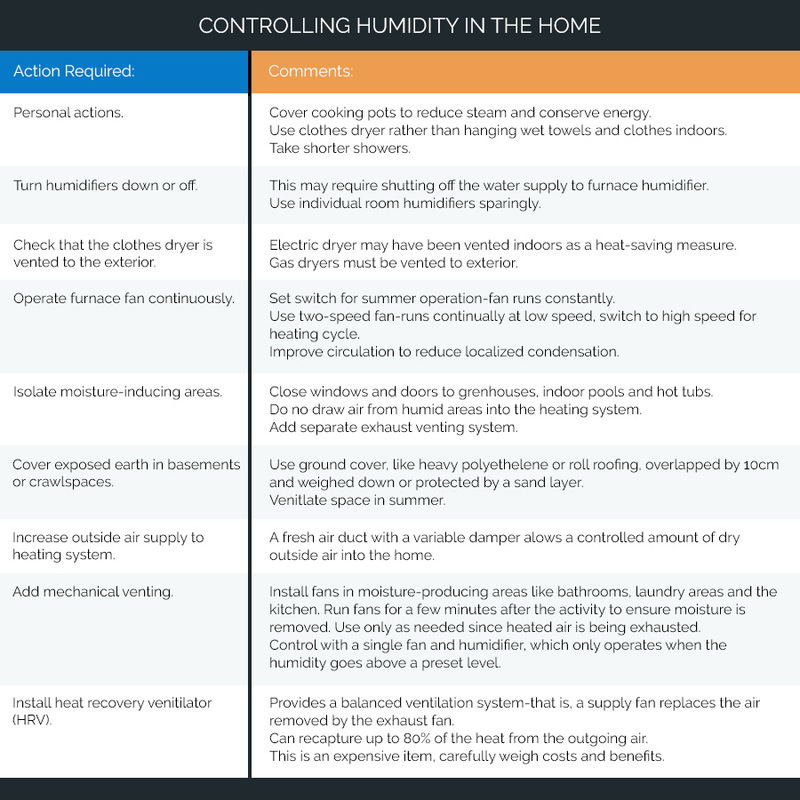 This guide to energy management will help you recognize the sources of excessive condensation and take action to remedy the problem. Air in the home is actually a mixture of air and invisible water vapor. The average family produces 10 to 50 litres of moisture a day from activities like cooking, bathing, washing dishes, and doing laundry. Condensation is the conversion of the water vapor into a liquid and usually happens when the vapor cools. The temperature at which vapor begins to condense is called the dew point. Condensation occurs whenever warm, moist air comes in contact with a surface or object cold enough to chill the moisture in the air below its dew point. As a rule, the coolest visible surfaces in a home will be the cold water pipes, windows, and hinges and locks on exterior doors. It is on these surfaces that condensation first becomes apparent. However, condensation may also occur in areas where it is not visible such as in the attic and exterior walls. Condensation on windows may be little more than a nuisance, but condensation on walls and ceilings can cause paint to peel. Hidden condensation can lead to problems that range from mould, mildew, and stains on walls and ceilings, to dry rot and destruction of a wood frame structure. Windows are one of the coldest surfaces in a house. Condensation forms on a window when the temperature of the glass is below the dew point of the air and the warm air that contacts it cools rapidly. Like glass, metal is also a poor insulator. If the window has a metal frame, condensation also occurs on the frame. Hidden condensation can occur when warm moist air migrates into the walls, attic, or other interior areas of the structure. Most of the moisture is carried into walls and attics by air leaking through openings for plumbing, piping, electrical boxes and wires, gaps between framing and drywall, attic hatches and other openings. If at some area in the wall or attic, the moist air encounters a temperature below the dew point, condensation will occur. Moisture inside the walls may also cause blistering of paint on exterior siding. New housing is required to have a continuous vapor barrier, sealed at all penetrations. This requirement is intended to prevent, or at least severely inhibit, hidden condensation. If the temperature is low enough, moisture may deposit as ice or frost. If the amount of moisture is small, it may change back into water vapor with a rise in temperature and be carried away by natural air movement. However, large deposits of ice will melt and soak insulation materials, ruin interior and exterior finishes and possibly lead to structural deterioration. Activities such as cooking, washing or bathing will often result in some condensation on windows for short periods of time during cold weather. Other than causing deterioration of the finish on wood frames, sills or casings, such condensation is harmless. Therefore, moderate, intermittent condensation on windows is probably no cause for alarm. However, if windows are consistently wet, or water stains appear on ceilings or walls, prompt action should be taken to avoid further problems. NOTE: Installing a dehumidifier does not solve overall home humidity problems, as it is only capable of lowering the relative humidity to 50% or 60%.